I love fresh veggies. And I love rice. And I love a spicy Vegan Sausage. And when you mix all these together you get this wonderful Vegan Jambalaya with Andouille Sausage recipe I made last night. And let me tell you, it was AWESOME!!! No worries – this is not a “OMG my tongue is burning off!” kind of spicy, but there is a nice warm afterglow when you take that first bite – and trust me, if my wife (who hates all things spicy) likes it, then you’re going to be just fine. Since I only get to cook on the weekends now, this is actually bonus day as you get TWO recipes in one. 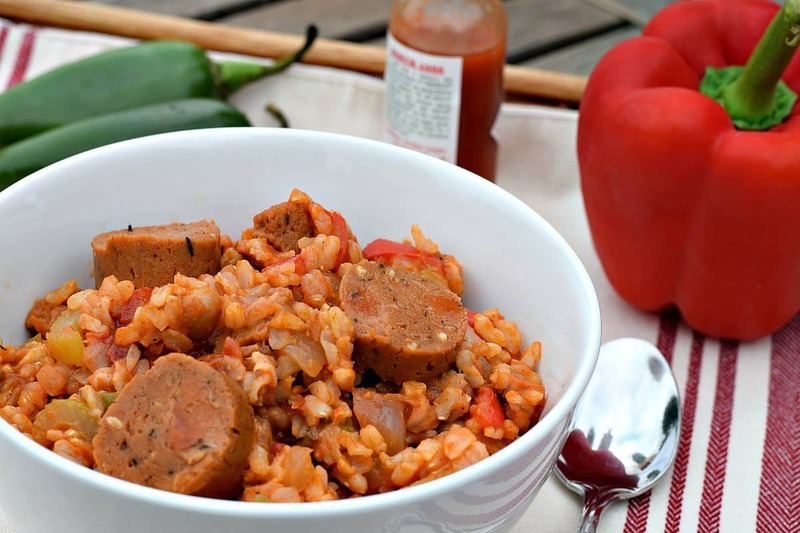 The Andouille Sausage and the Vegan Jambalaya. Each recipe takes about an hour to make so plan ahead. And of course the Vegan Jambalaya can me made without the sausage but let me tell you, it does add some really good flavor and texture to the dish. And to all my men readers out there…..guys, you’re really going to love this. I used my Italian Sausage Photo here – the Andouille Sausage basically looks the same only a bit more red in color. The Sausage Recipe for this dish is intended to replicate Andouille Sausage – a famous Louisiana Cajun Sausage known for it’s spiciness. I definitely toned down the heat on this one, but if you like it really authentic – feel free to add a bit more Cayenne Seasoning to get the heat level you like. I used my Italian Sausage Recipe to make the Seitan, which is simply a mix of white Cannelloni Beans, Veg Broth, and Vital Wheat Gluten as the base of this recipe, only I modified the spice mix to try and create a more Cajun Flavor. 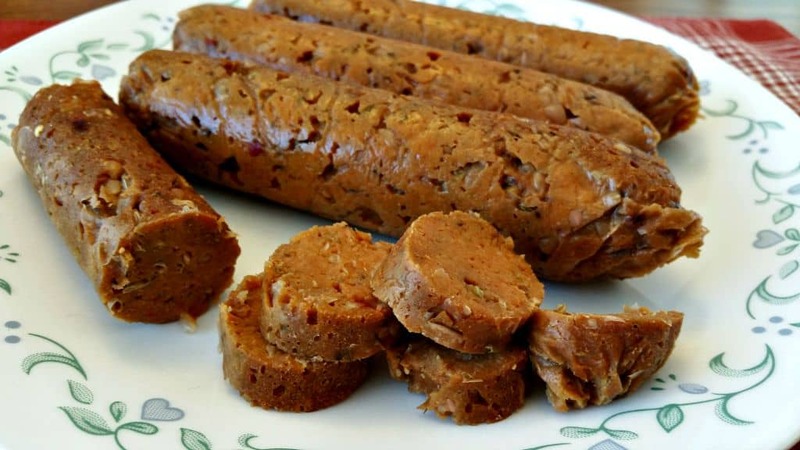 To make Seitan Sausage, simply mash the beans with a potato masher or fork, and then mix the mashed beans, the wet ingredients, and the spices in a large bowl. Then slowly mix in the Nutritional Yeast and Vital Wheat Gluten until you have a soft, spongy dough. Knead the dough for a minute or two, and then cut it into 4 equal sized pieced. Roll and stretch each piece into a rough sausage shape and then seal tightly in Aluminum Foil, like a big Tootsie Roll. My first bite told me this recipe was going to be good, and trust me – it was. This sausage is easy to make and really adds just the right oomph to send this Vegan Jambalaya over the top. Keep scrolling down to see the Jambalaya Recipe. 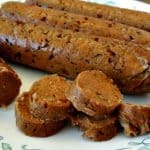 A spicy Seitan Sausage that replicates the famous Cajun Sausage used in the south, Great in Gumbo, on a roll with some hot mustard, or especially sliced up in my Vegan Jambalaya recipe. In a large bowl mash beans with a potato masher or fork until smooth. Add in veg broth, soy sauce, tomato paste, and all the spices until mixed well. The Jambalaya portion of this recipe is the easy part. One pot, no muss no fuss. It could probably be adapted easily for a crock pot as well. Simply saute all your veggies, and when softened, add your tomatoes and spices, mixing well to distribute. When bubbly, add in your Brown Rice and Veggie Broth and bring to a boil. Once it comes to a boil, cover and reduce the heat for 45 minutes or so until the rice is done. Stir in the sausage right before serving and mix well. Again, there is a tiny bit of heat from the spices in this recipe, but the heat can easily be adjusted up or down by playing with the amount of Cayenne Pepper you use. My wife was really surprised as to how good this was and like I said – she does NOT like spicy AT ALL. Give me a yell if you make this and please tell me what you think. I think this is going to become a new favorite!! Rice, Veggies, and just the right amount of spice brings this Vegan Jambalaya to the plant-based world. Add in my Andouille Seitan Sausage and you can almost hear the band down on Bourbon Street! Heat until bubbly and then add in Veg Broth and Rice. Reduce heat to low and cover for 45 minutes. Stir in Sausage during last 5 minutes or so if using. Hello! We are totally new to this lifestyle and have so many questions! 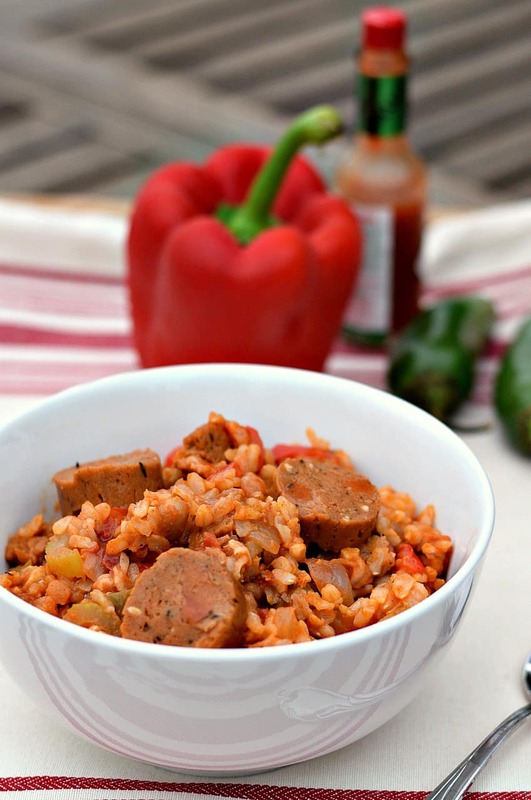 We were just saying how we miss jambalaya – and this amazing recipe pops up this.morning – fate! We are curious about the vital wheat gluten in the sausage recipe? We have not seen this ingredient in any of the recipes we have been researching yet. What exactly is it and where can it be found? We were also wondering if this recipe could be frozen into individual portions for lunches? We’re going to try this asap – thank you! Awesome, we will look for the VWG asap! Haven’t tried freezing it yet, but I don’t see why it wouldn’t work. I’ve been craving jambalaya. How did you know?!?! Thanks so much for the recipe. Dinner was delicious. This does take a bit of time; I’m thinking of making a few batches ahead, then freezing the sausage rolls, just to have on hand for when I decide to make these again. These sausages look good, I still haven’t tried making vegan sausages. You really should!!!! Chuck also makes an AMAZING seitan meatloaf too!!!! Chuck is really a vegan genius. Thank you Chuck!!!! Have you tried making the sausages in the Instant Pot with the “steam” function? Would pressure steaming keep them from puffing up? They are wonderful, by the way. Hi Lauren, this is a little late, but I cook my sausages in the instant pot on the steam function for 40 minutes. I only use parchment to wrap them and weigh them down with a plate. This was the best vegan sausage I’ve made. The others I’ve tried came out all spongy. Thanks! I made this amazing seitan dish, but used the seitan to make a louisiana red bean and rice. We eat red kidney beans and cook it with a bunch of seasonings until it falls into almost a mush and smoke sausage is added to it for the smokey flavor. Well this seitan did the same thing. It was to die for. Then we eat it served over rice. Do you have a suggestion for how to make this without the Wheat Gluten? No. Vital Wheat gluten is the prime ingredient in making Seitan. Sorry. Is there a way to make the sausage without a steamer? If not, which steamer do you use? I actually just use an old Black & Decker Rice Cooker which has a steamer basket included. Is it similar to a 1/2 pound of traditional andouille sausage?? I am working with a recipe for an 2 1/2 ethnic pork sausage that I want to change to an whole food no oil style . It will make 4 sausages, about 6 inches long. I’m guessing equivalent to a half pound, maybe a pound. I’d try this amount first and see if you need more. Made this this weekend and it was great! Everyone loved it. I tripled the sausage to have leftovers. The rice was perfect too. We’ve been vegan for 5+ years but this was my first attempt at sausage. It was great! Thanks!